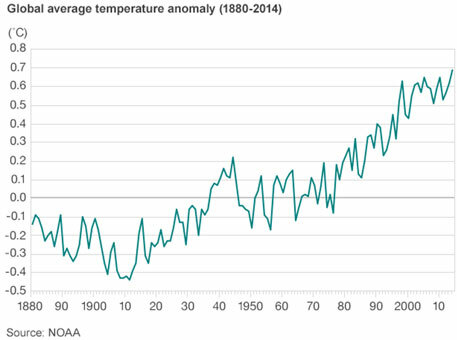 2014 was the warmest year since record keeping began, with average temperatures across the world registering an average increase of 0.69°C above the 20th century average, according to US’ National Oceanic and Atmospheric Administration (NOAA) and NASA. The December temperature was also the highest on record, a NOAA press release said. Earlier, UN’s specialized agency, World Meteorological Organization (WMO), had released a provisional report, saying 2014 was on track to becoming the hottest, or one of the hottest years on record. The 10 warmest years on record, with the exception of 1998, have now occurred since 2000. This trend continues a long-term warming of the planet, according to an analysis of surface temperature measurements by scientists at NASA’s Goddard Institute of Space Studies (GISS) in New York. Scientists attributed the temperature rise to carbon dioxide and other green house gas emissions released because of by human activity. Majority of the warming has occurred in the past three decades, a US government news release said. While 2014 temperatures continue the planet’s long-term warming trend, scientists still expect to see year-to-year fluctuations in average global temperature caused by phenomena such as El Niño or La Niña. These phenomena warm or cool the tropical Pacific and are thought to have played a role in the flattening of the long-term warming trend over the past 15 years. However, 2014’s record warmth occurred during an El Niño-neutral year, GISS said. During December 2014, the global average temperature for land and ocean surfaces was 0.77°C above the 20th century average. This was the third highest for December in the 1880-2014 record. 2014 Ã”Ã‡Ã´ Global temperature distribution picture shows, some areas are warm and some other areas are cold. The same is not reflected in 2010 Global temperature picture. That means, these are associated with the differences in localized general circulation patterns Ã”Ã‡Ã´ natural variations may be a part of this. The global temperature rise trend is a function of several factors. These include local/regional factors like heat-island & cold-island and global factors like global warming. Accuracy of met observations over space & time are quite different [Africa versus Europe/USA]. Met net work over space & time are quite different [for example northeast Brazil and USA]. In the case of local/regional factors, urban-heat-island effect is over emphasized with dense met network & rural-cold-island effect is under emphasized with sparse met network in the global temperature averaging. Then, there is another important factor: extra-terrestrial affects. Or are the highest and lowest are the part of natural cycle??? Can we separate all these factors while assessing the highest or lowest global average yearly temperature? So, the best way account this is from satellite data. Let somebody present this information. Then we can understand the slowing or pause or something else. Here one important point I would like to share from the reports in international media. The 2014 temperature is more by 0.2 oC over 2010 [or 2005] and another report says it is 0.4 oC. Then what about 2010 value? Which value they used to get the difference. For that matter all years prior to 2014, which value the global temperature referring? Sorry, a minor correction --- it is not 0.2 & 0.4 but they are 0.02 & 0.04 oC.